Warning: if cleanses or detoxes of any sort may trigger you, this would be a great time to stop reading this and go to the Shiba category and look at cute animals! I wanted to do a cleanse, but not a full on one because those turn me into a crazy person. I think it’s a little beyond my mental capacity right now. My real goal is to get myself off sugar. Every time I eat something with very much sugar I feel like garbage, but I can’t stop eating it! There’s always chocolate at work, J keeps sugary snacks at home- and I have no self control even though I know it makes me feel gross. The guidelines of my cleanse are no added sugar (fruit is okay), no alcohol, no caffeine, and extra fruits and veggies. I already don’t eat meat, and I limit dairy and eggs. I’m doing smoothies at work, because I need to go cold turkey if I’m going to get off this sugar habit. Basically, I’m doing a cleanse like BluePrint, but I’m making up my own rules and not spending $65 a day (I’m sure they’re lovely people, but come on. really?!). I’m also doing smoothies instead of juice because for me, cutting the fiber out of my food seems silly. I don’t understand why people drink juice and laxative tea, when they could just leave the fiber in their juice… anyway, I’m digressing. So I made three smoothies on Sunday night, roughly following this recipe. I used mostly spinach, with banana, cherries, and water. Then I made two protein shake/smoothies. I used half water and half unsweetened coconut milk, plus one serving of protein powder and 2/3 cup of mango. This is what I had throughout the day on Monday, though I didn’t drink the third green smoothie. Then I ate a normal dinner, but without dessert or alcohol. I did the same thing yesterday. It has been hard to resist sweets, but it’s easier for me when I flat out tell myself it IS NOT an option. I will continue for a week or until I start to feel like I will drown in smoothies. I think that a week is a good goal. I actually started on Sunday, so I just have to make it through Saturday! After three days of this, I am still very close to last week’s weight. This is probably good, I am filling my body with nutrients and not losing water weight. I had my first (of three) personal training sessions last night! She kept having to cancel, so I was really losing motivation. Now it’s back! It’s back because it was a wake up call in a big way. The set up was probably the worst possible scenario for someone that is seeking personal training because they are unhappy with their body. One wall is mirrors, two walls are floor windows that go to the parking lot and sidewalk. Anyone in the world can watch. I know that no one cares, but it’s still hard to not feel like you’re in a fishbowl. I also have been avoiding truly looking at my body, and the outfit I chose, the mirrors, and the lighting did not allow me to hide anymore.I need to get serious so I can feel better about myself, and feel better in general. Note: I use Arbonne protein powder (this is an affiliate link- if you buy this I will get a small percentage). It is vegan, gluten free, soy free, has no artificial sweeteners, and tastes like cake batter. I’ve only tried the vanilla, but it’s good with everything. Arbonne is one of those weird club things. If you or someone you know is in the club, you should definitely buy it from there because it’s cheaper. Sometimes I do that, but if I can’t get on board with someone else’s order I get it off Amazon. I thought I would mention it because it’s so hard to find vegan protein powder, and this is the only one I’ve ever liked. A lot of people like Sun Warrior, but I can’t stand it. It feels like sand in my mouth. I’ve used the Vega protein powder because it is vegan and gluten free. But maybe it is a Canadian thing? Your powder tasting like cake batter sounds delicious!!! I have heard of that, but never tried it. First, I do and love my yoga – I watch a YouTube pod cast (Dr. Melissa West, Namaste Yoga if you want to check it out) almost every day at lunch (I also work from home, so that helps) or after dinner, I have really enjoyed it! Second, good luck with the cleanse. I’ve recently become vegetarian due to some health issues and sadly, I’m thinking sugar may be next… Actually, I’m in denial over the fact that I’m a sugar addict, and right now, I’m okay with that – but let me know how it goes! I’ve been in denial about the sugar thing for a while, but I just have to do something. It’s so out of control. Yoga before bed sounds so great, I will check it out! 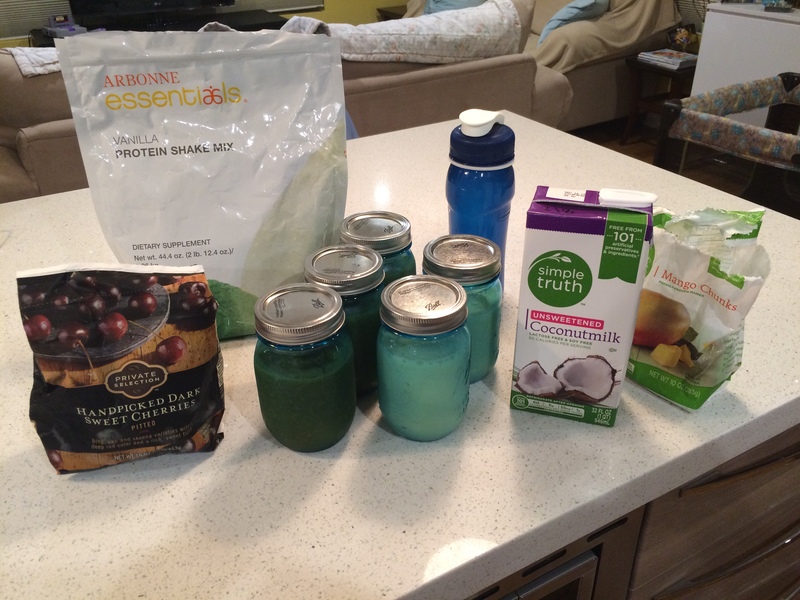 I love this smoothie cleanse idea, and I agree that smoothies make more sense than juice. I feel gross when I eat sugary stuff too! “I flat out tell myself it IS NOT an option” <<< this has been the key for me anytime I try to make a big change. Other things help, but if I skip that step, I'm doomed. Me too. If I can get myself in that mindset I’m okay, but once I break the seal it’s all over.